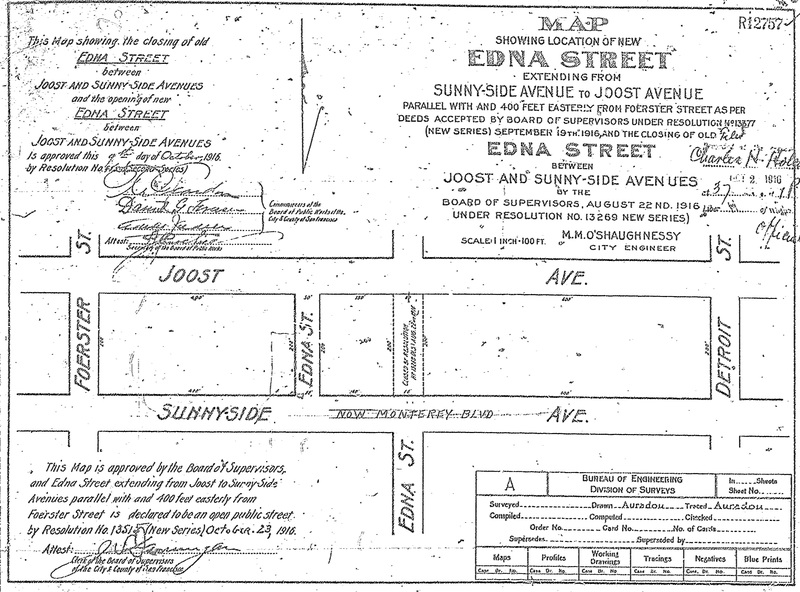 In 1916, one block of Edna Street north of Monterey was closed, and relocated 200 feet to the west–the dogleg portion. 1916. New location of Edna Street. County Recorder’s Alpha Maps. View larger. Part of a series of articles about Sunnyside School. Until the mid-1970s, Sunnyside Elementary School had an odd structure that projected into the playground area, called the Arcade. It was about twelve by forty-five feet, one large room, and at least during the 1950s and 1960s housed the school library. What is the story behind this quirky feature? 1940s. Sunnyside School, viewed from Hearst Ave, showing “arcade” structure. San Francisco History Center, San Francisco Public Library. Recently a marvelous panorama taken about 1912 came my way. Sunnyside can be seen in the distance. The image reveals a feature from the neighborhood’s past–a giant hillside sign in the style of the one in Hollywood that was also placed as a real estate advertisement. However, Sunnyside’s sign preceded the more famous one by at least ten years–though of course ours didn’t last. 1912. The Sunnyside sign, on hillside near Mangels and Detroit. Detail from panorama image below. Western Neighborhoods Project wnp15.1592. Although Sunnyside Playground is a favorite destination for families, little known to even locals is our other park, Dorothy Erskine Park, located at the top of Baden Street. Poised on the edge of a rocky outcropping, the small park affords great views of the southeast of San Francisco, from among a grove of eucalyptus trees—though without even the amenity of a bench from which to enjoy the vista. 2018. View from Dorothy Erskine Park. 2018. A nearby neighbor enjoys the view after just discovering the park for the first time.